Hwange Coalfield is situated in the North-Western corner of Zimbabwe. The sediments of the area are part of the Karoo system. combination of fireclay and carbonaceous mudstone form the Overburden stripped by Dragline mining operations. In areas where the depth of Overburden exceeds 35 metres, a coarse grained upper Wankie sandstone is encountered usually in the form of a capping on top of small kopjes. 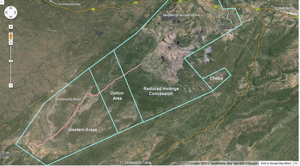 Operations on Chaba mine commenced in February 2006 with overburden production so as to expose coal. First tonne of coal was mined in April 2006 and an overall 22563 tonnes was mined in the same month. The mine’s output has been going up every month since then. It was developed as a new strategy pip to exploit the Chaba East reserve as this presented best option to preserve Hwange Coking Coal (HPC) raw coal mining capacity to levels consistent with established demand as well as opportunities for a consistent supply of low phosphorous coal from the dragline pit that has the greatest potential to capture new markets for locally and exports. Use as strategic pit for current operation. 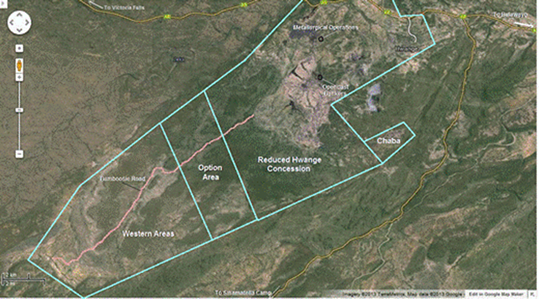 1.1 The Western Areas Coalfield is located approximately 20km south west of Hwange town, adjacent to HCCL’s Mining Lease No.1 (Option Area), in the Deka Safari area. The Company was issued with Special Grant 5950 to explore for coal and coalbed methane in the Western Areas Coalfield. In November 2017, Hwange Colliery Company Limited signed a $5,080,364 exploration drilling contract with Fugro Earth Resources Pvt Limited and work is expected to commence in 2018. 1.2 The exploration programme covers the whole Coalfield, but commencing in the potential opencastable area and then extending into the deeper underground areas. h) SAMREC Code Compliant Coal Resource and Reserve definition and reporting. 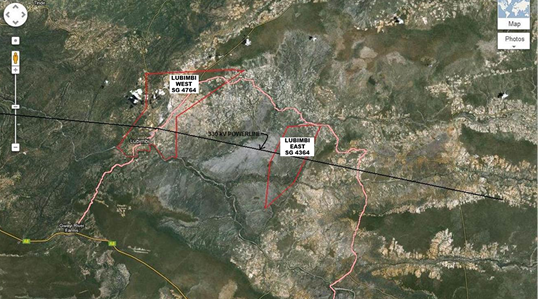 2.1 The Company was issued with special grants to explore for coal in Lubimbi West (SG4764) and to explore for coal and coalbed methane in Lubimbi East (SG4364). The special grants are located in the Lubimbi Coalfield that is approximately 245km north of Bulawayo and about 120km south east of Hwange town. b) An internationally recognised Coalbed Methane Resource / Reserve statement to be produced.